Pride is a celebration of diversity, inclusion and love and we fully support Starkville Pride as they pursue a peaceful resolution to what we believe has been a miscarriage of justice by their city government in not allowing them the opportunity to peacefully assemble to celebrate our community’s love and support for those individuals who identify as gender and sexually diverse. 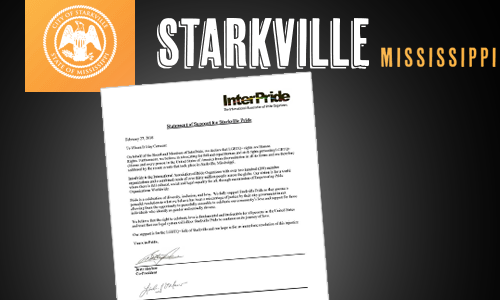 We believe that the right to celebrate love is fundamental and inalienable for all persons in the United States and trust that our legal system will allow Starkville Pride to continue on its journey of love. Our support is for the LGBTQ+ folk of Starkville and our hope is for an immediate resolution of this miscarriage of justice.